Mendocino Farms, a California-based restaurant chain, is opening a location at the Ice Blocks on R Street tomorrow. Offering a “chef-driven, seasonal farm-to-table menu,” Mendocino Farms has lots of great options for vegans. 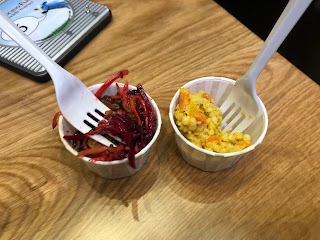 I attended a preview event there last week, and tried every vegan dish they were passing around. Some of the dishes, such as the tofu skewers and the crudités with three different vegan sauces, are available only on their catering menu. However, they were also serving two items from their regular menu that I know will be popular with local vegans. 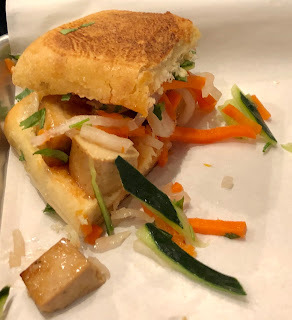 The banh mi sandwich, served on Mendocino Farms’ excellent ciabatta, is filled with baked tofu, pickled daikon and carrots, cucumbers, jalapeños, cilantro, vegan aioli, and sweet chili sauce. I’m not usually a big fan of banh mi sandwiches, but I would definitely eat this again. They were also serving the Impossible taco salad, which, as its name suggests, is made with Impossible Burger meat to which chorizo seasonings have been added. 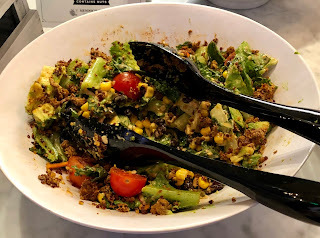 This salad also includes romaine, curly kale, succotash made from black beans, corn, and jicama, red onions, tomatoes, avocado, and cilantro. The dressing is a house vegan chipotle ranch. This salad was a hit even with the non-vegans. Last night, I went back with my husband Phil for a staff training dinner, which was also a fundraiser for three local elementary schools. In lieu of paying for an entrée and a drink, diners were asked to donate to one of the three schools. I ordered Mendo’s smokehouse tempeh sandwich, consisting of barbecue house-smoked tempeh, mustard pickle slaw, tomatoes, red onions, and vegan aioli, served on toasted ciabatta. I really liked the flavor of the tempeh in this sandwich. They were also offering samples of their side dishes, so I ordered the two that were vegan. The one on the left in the picture below is a mix of julienned raw beets and carrots, kale, golden raisins, and I don’t know what all. The one on the right is curried couscous and cauliflower. Both were very good. Other vegan items at Mendocino Farms include a falafel wrap, and a Chinese chicken salad that can be made vegan with a couple of substitutions. They also have an avocado and quinoa superfood ensalada that, if it can be made without the cojita cheese, seems like it would be fabulous. 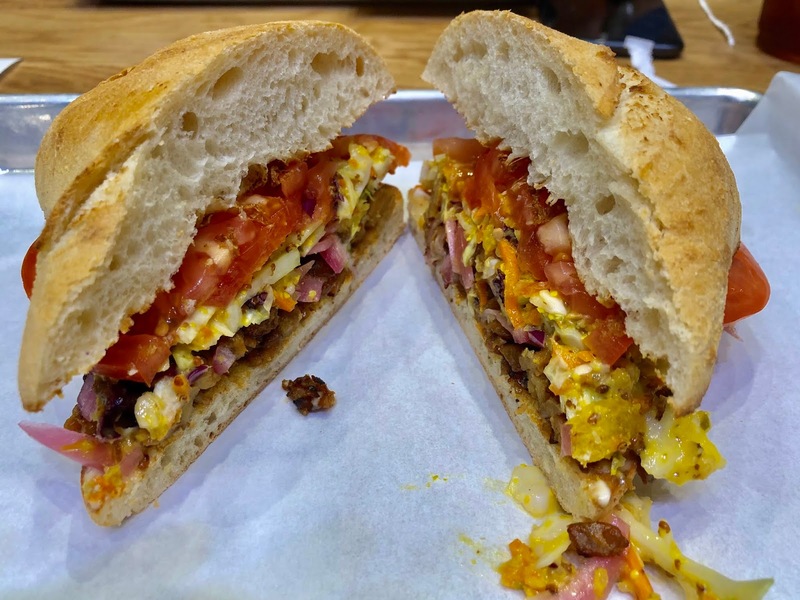 Mendocino Farms is located at 1610 R Street, and their phone number is 916-368-5400. Their website address is https://www.mendocinofarms.com/, and their Facebook page can be found at https://www.facebook.com/MendocinoFarms/. The restaurant will be open daily from 11:00 a.m. to 9:00 p.m.